Reading City Hall is located at 815 Washington Street, Reading PA 19601; phone 610-655-6000. Photo: Homes on Centre Avenue, ca. 1920, Reading, Berks County, PA. Relatively little is known of the Native American settlements that were located on land now occupied by the City of Reading. As the Lenni Lenape tribe occupied this part of the country, the settlements were likely seasonal rather than permanent, a pattern that is consistent with the semi-nomadic lifestyle of these people. All of what is now the Commonwealth of Pennsylvania was granted to William Penn by King Charles II of England as repayment of a debt owed to Penn's father. Unusual for his time, Penn believed that the real "owners" of his new territory were the original inhabitants. Upon his arrival in the New World, he proceeded to bargain with the native peoples for the right to the property granted him by the Crown. Consequently, the early history of Pennsylvania is notably free from the battles with natives that characterize the European settlement of most of the United States. The European settlement of Reading did not begin until the 1730's, when it was first divided into six tracts of land. These parcels later become part of a plan for the "Towne of Reading" proposed in 1743 by William Penn's sons Richard and Thomas. The Penn brothers named the town after Reading in Berkshire, England, the ancestral "shire" of the Penn family. Officially laid out in 1748, Reading's original plan featured 520 lots and 204 out lots in a grid pattern as well as two principal streets. Penn Street, named for William Penn, was laid out in an east-to-west orientation perpendicular the Schuylkill River, and incorporated part of the Tulpehocken Road that connected Philadelphia and Harrisburg. What are now the 400 and 500 blocks of Penn Street were historically called Market Street, since those blocks were the location of farmers' markets until 1871. Conrad Weiser, a prominent figure in the County's early history, operated the City's first general store on a lot purchased in 1749 along Penn Street. Callowhill Street, currently known as Fifth Street, was named after Hannah Callowhill, William Penn's second wife. It is laid out in a north-south direction, intersecting Penn Street at right angles. Most streets in the new "Towne" were originally given the names of royal titles and those of Richard and Thomas Penn, receiving their present names in 1833. When the County of Berks was created in 1752, Reading became the County seat. The original Courthouse was erected in 1762 in what is now Penn Square. Reading grew, becoming an incorporated borough in 1783, a city in 1847, and a Third Class City—its current status—in 1874. Transportation and its effects were largely responsible for Reading's early growth. Ferries were used to cross the Schuylkill River until the first bridge was built in 1810 downstream of what is now the Schuylkill Avenue Bridge. In 1817, the first Penn Street Bridge was built, followed by a bridge at Bingaman Street in 1831. The first major roads to connect Reading with other cities were turnpikes. The Centre Turnpike Company, incorporated in 1805, built a road to the north, the Perkiomen and Reading Turnpike (1810) led southeast, and the Berks and Dauphin Turnpike (1817) headed west. Stagecoaches provided inter-city transportation along these and other routes between 1786 and 1838. By the late 1820's, two canals served Reading, establishing the City as a halfway point in the system of canals linking the Susquehanna River with the Delaware River. The Schuylkill Navigation Canal, connecting Reading and Philadelphia, was completed in 1824; the Union Canal was in operation by 1828. The relative ease of movement afforded by these early "highways" resulted in a period of industrial growth during the first half of the 19th Century. The City's early industry consisted of smaller enterprises in trades, crafts, and light manufacturing. Local factories produced beer, cigars, shoes, and boots. Reading was also a thriving center for hat making: in 1806, there were 40 hat factories in the City. Reading developed rapidly between 1825 and 1850. The Industrial Revolution of the 1830's brought to this country the invention of steam-powered machinery and a surge of advances in heavy industry and transportation. The new railroads were so successful that the stagecoaches and the new canal system were unable to compete and were eventually abandoned. The largest local railroad was the Philadelphia and Reading Railroad. Incorporated in 1833, the Philadelphia and Reading constructed the first rail line from Reading to Pottstown in 1837. This line was extended to Philadelphia in 1839. The company originally built the line to ship coal from Pennsylvania's anthracite region to the markets and ports of the eastern seaboard: there was no passenger service until the 1840's. The Philadelphia and Reading eventually became one of the largest railroad industries in the nation, and was (briefly) the largest industrial corporation in the world just prior to the Civil War. It was an industry unto itself, constructing its own railroad shops where the first coal-burning engine was designed and built. Other early industries included the Reading Iron and Nail Works and the Carpenter Steel Mills, along with hosiery and knitting mills, hardware production, foundries, machine works and flour mills. Other factories produced a variety of goods including bricks, furniture, combs and brushes, and pianos. The Civil War period brought greater demand for goods, causing factories to increase in size as well as number. The jobs provided by the railroad and the City's many other thriving industries were a powerful attraction to new immigrants seeking work. Reading's original population was largely of German heritage. Now, immigrants from Ireland, Poland, Italy and the Ukraine settled in the southern part of the City, right among the factories where they worked. 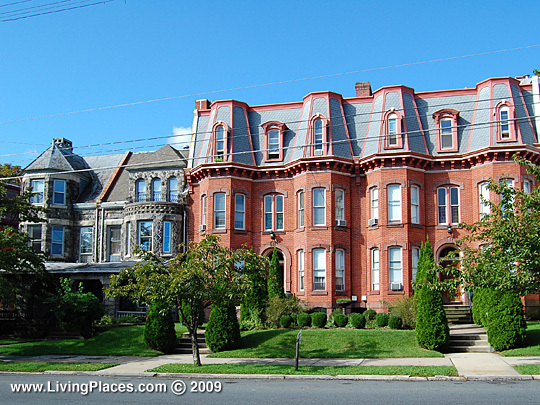 As the immigrants and laborers settled in the southern part of the City, the introduction of the trolley in 1874 allowed Reading's wealthy industrialists to move north, building their Victorian-era mansions along Centre Avenue and establishing that neighborhood as one of Reading's first suburbs. The boundaries of the City grew to the north and south, and by the late 1860's, the City limits included most of what is now the heart of the City. The Riverdale, Northmont, and Glenside neighborhoods were added in the early 1900's along with the 18th Ward and an area of Mt. Penn. The City achieved its current configuration in the late 1960's. At the dawn of the 20th Century, Reading was a major manufacturing center. As the City's population grew, technological advancement led to modern industry and the manufacturing of machinery and automobiles. Retail activity became important, and the City had several large department stores. In 1923, there were 700 manufacturing institutions producing more than 300 different kinds of goods. Reading boasted the largest brick kiln in the country and was an important center for both hosiery manufacture and the production of builder's hardware. The economic depression of the 1930's affected the City just as it did the entire nation. However, the railroad and its related industries fared better than most because the rails were still used to move most basic commodities. The Depression still marked the beginning of the City's sevendecade decline in prominence as a population and manufacturing center. The 1930 Census reported that the City was home to 111,171 people, or 48% of all Berks County residents, a peak that has never been equaled since. City of Reading, Pennsylvania, Comprehensive Plan, 2000, www.readingpa.gov, accessed June, 2015.